This is the perfect book to read this fall to lead into a discussion about how to look at and read books in the library or classroom. But it's also a great book to give as a gift for a new parent who might be wondering how exactly to model reading while having fun with their child. 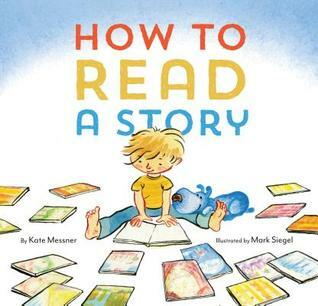 How to Read a Story was written by Kate Messner and illustrated by Mark Siegel, published by Chronicle Books, 2015. You’d think that a story about how to read a story would be a little dull, but this book is quite entertaining. It’s a good example of a book that uses a numbered step structure. Notice that this kind of structure helps propel you to turn the pages, to see what the next step is going to be. I liked the illustrations because they were clear and would be great for viewing from a small distance in a group read aloud. The main character's reading buddy provides a lot of humor and interest. I love finding books that can be used in many different ways in the classroom. This book models procedures (Step 1, Step 2, etc. ), how to read with a buddy, and also some strategies for reading, such as making predictions. I decided to purchase this book for my personal collection, since it would be a great lead-in to a discussion on how to look at books in a classroom. For another take on this book, visit This Kid Reviews Books. 1. Choose a favorite book, find a buddy and read together! 2. Write out steps for something you like to do. 3. With a partner, make a poster for one of the steps for reading from the story. 4. Draw pictures in speech or thought bubbles to show something you found inside a book. If you haven't had a chance to take a trip this summer, reading this novel is almost like visiting Paris! It's a sad but sweet story about family, friends and learning to take chances. Nora loves everything about Paris, from the Eiffel Tower to chocolat chaud. Of course, she's never actually been there -- she's only visited through her Grandma Sylvia's stories. And just when they've finally planned a trip together, Grandma Sylvia is suddenly gone, taking Nora's dreams with her. Nora is crushed. She misses her grandmother terribly, but she still wants to see the city they both loved. So when Nora finds letters and a Paris treasure map among her Grandma Sylvia's things, she dares to dream again . . .
She's not sure what her grandma wants her to find, but Nora knows there are wonderful surprises waiting for her in Paris. And maybe, amongst the croissants and macarons, she'll even find a way to heal her broken heart. 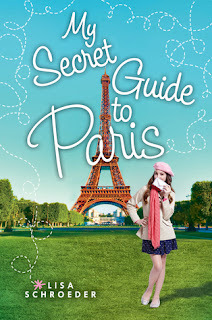 My Secret Guide to Paris by Lisa Shroeder, Scholastic Press, 2015. This was an emotional story about a girl coping with her grandmother’s death and taking chances as she develops a stronger relationship with her mother. Traveling around the Paris to find “treasures” was a fun way to keep the story moving and bring in interesting details about the city. If you write for children, consider studying this novel to see how to create an interesting setting without taking away from the story. Lisa Shroeder is the author of over ten middle grade and young adult books. She lives near Portland, Oregon and has been writing since she was a child. Here’s what she says about why she loves to write: "Between the pages of a book, we can visit new places, make new friends, and when we're having a hard time, perhaps feel a little less alone in the world." For more, visit Lisa Shroeder's website. If you'd like a middle grade reader's perspective on this book, here's a review from Books with Nicole, who says she "learned a lot of things." Here’s a true confession about me: When I was around 10, I used to make little mice out of pipe cleaners and felt, and created entire families and little houses, complete with their family trees. So it’s not surprising that I went to find this book right away when it became available at my library. Hermelin is a special little mouse. He was born in a box of cheese and lives in an attic at 33 Offley Street. He can read books and type notes on his typewriter. Most importantly, Hermelin can solve mysteries. And the people of Offley Street are in need of a detective! Again and again, Hermelin is on the case—the anonymous hero. 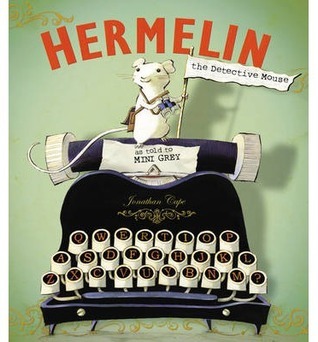 But when his neighbors invite him to a thank-you party in his honor and find out who Hermelin really is—a MOUSE!—will he still be welcome on Offley Street? Hermelin, the Detective Mouse was written and illustrated by Mini Grey, and first published by Alfred. A. Knopf in 2013. This will be an interesting book for both writers and illustrators to study. For writers, it’s an interesting example of a story told in first person, which is not that common in picture books. It’s also a mystery! Although I’m not an illustrator, I noticed lots of creative design elements in this book, such as notes typed on a typewriter, speech bubbles, labels on packaging, newspaper clippings, invitations, a dictionary and banners, as well as visuals that show a mouse’s perspective. This would be a fun story to encourage students to pay attention to the world around them. It would be useful in teaching perspective-taking, and could be compared to the movie Ratatouille. Because of all the small signs and details, I think slightly older elementary students would enjoy it too. Create your own detective character, and think of a mystery for them to solve. Create clues! Or, write about what mini-mystery Hermelin and Emily might solve next! Study some different labels and see what words you can find! Create a piece of art using labels, pieces of newspaper, lists and wrappers. Draw a picture or write a story that describes how the world looks to a creature that is very different from yourself.